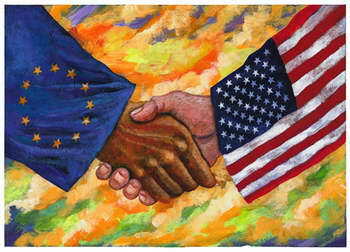 This article was written by Neil Vander Most for the European Union Center. On Wednesday October 28th, 2015, the European Union Center, working in close coordination with Illinois State University, organized a day of activities involving former Member of the European Parliament Michael McGowan and visiting scholar from the Catholic University of Leuven, Dr. Kolja Raube. Together, these gentlemen met with a number of students and faculty members both at Illinois State University and Illinois Wesleyan University. These two distinguished scholars brought with them a wealth of experience and information about the institutions and politics of the European Union. Former MEP Michael McGowan of the UK was the president of the Committee on Development and Cooperation and is an expert on the international relations of the European Union. He is also a former journalist and broadcaster with BBC television and radio. For Dr. Raube, he is a senior researcher for the Leuven Center for Global Governance Studies and the Programme Coordinator for the Catholic University of Leuven’s Center for European Studies. He has an active research agenda that investigates the foreign policy of the European Union, especially its coherence on the global stage and the role that the European Parliament plays in steering such policy responses. Together with EU Center Staff and EU Affiliated Faculty Member Dr. David Cleeton, Mr. McGowan and Dr. Raube met with students in ISU’s Economics and Political Science programs. They fielded a range of thought-provoking questions about the various challenges that face the modern European Union. These included the threat of a British exit from the EU, the Euro and migrant crises, and the current state of the Schengen area. Later, this group visited Illinois Wesleyan University to attend one of their economics courses which lead to further productive discussions about the state of the modern European Union. The next day, on October 29th, the European Union Center sponsored a question and answer session with Mr. McGowan at the University of Illinois. Meeting with a large number of students and faculty from all disciplines on campus, Mr. McGowan further shared his expertise and unique perspective. Mr. McGowan’s unique position as both an insider and outsider to the EU allowed him to field a wide variety of difficult questions with thoughtfulness and ease. Speaking as a former Member of the EU Parliament, he gave insightful responses about the way the EU actually functions and how it responds to events in the world. And, as a British citizen and politician, he was also able to speak to doubts in his home country about the effectiveness and legitimacy of the EU and put these feelings into a larger context. Mr. McGowan also addressed questions about the recent election of Jeremy Corbyn as the leader of the Labor Party in the UK and the consequences of this leadership change on British politics more broadly. The interests of the students and faculty at ISU, IWU, and the University of Illinois led to numerous constructive discussions that challenged and informed all involved. These exchanges of ideas ultimately helped strengthen transatlantic ties.